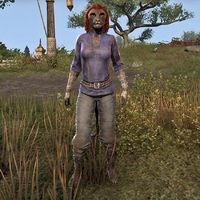 Bezera is a Khajiit farmer found at the Windcatcher Plantation. Talking to her, she'll say, "We were very lucky to survive this storm. Khenarthi smiles upon us, or perhaps we are just lucky. Either way, Bezera is grateful." This page was last modified on 3 February 2018, at 23:11.